Thanks for Kirsty’s comment on Maxillaria sophronitis about humming birds. 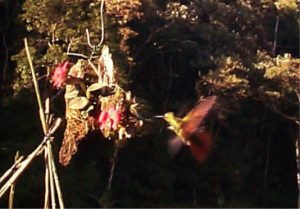 In 2000 on our first visit to Brazil students took this lovely photograph of a humming bird visiting Cattleya wittigiana. Students recorded six species visiting the flowers but only one species of hummingbirds removing pollen. What is Kirsty’s comment? It isn’t showing. It is a fantastic photo of the hummingbird!